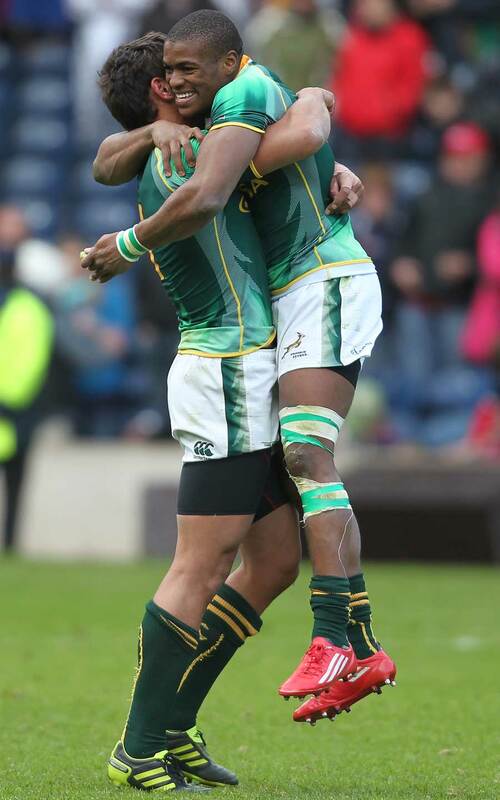 South Africa claimed the final HSBC Sevens World Series title of the season in Edinburgh with a dramatic 36-35 victory over Australia at Murrayfield. In a breathless Cup final the injury-hit Blitzbokke battled back from 35-14 down to claim their third Series title of the campaign with replacement Sibusiso Sithole crossing for the match-winning try in the dying seconds. The result lifts Paul Treu's side, who also won last weekend's event at Twickenham, into second place in the overall standings behind champions New Zealand. Fiji defeated Samoa 26-14 in the Plate Final to finish fourth in the Series, behind third-placed England, while Kenya beat hosts Scotland 21-14 to take the Bowl crown and Canada saw off Russia 17-12 to win the Shield. Australia booked their place in the Cup finale for the first time this season with a 19-12 victory over cross-Tasman rivals New Zealand with Ed Jenkins, Jacob Taylor and Greg Jeloudev all scoring. They had previously accounted for Fiji with a 24-14 victory in their quarter-final clash. Elsewhere, South Africa came from 12-0 behind to beat reigning Rugby World Cup Sevens champions Wales 22-19 in their final four encounter with Botha, Kyle Brown, Steven Hunt and Paul Delport all crossing. Earlier in the day, defending Edinburgh Sevens champions Samoa were beaten 28-5 in the quarter-finals. Wales, buoyed by their first Cup semi-final since 2009 last weekend, reached the same stage at Murrayfield after Gareth Owen scored a penalty in 13-10 sudden death extra time win against France, whilst Frank Halai scored his second hat-trick of the tournament in New Zealand's 26-12 victory against England in the quarter finals. Fiji's victory over Samoa in the Plate Final saw them collect 12 Series points and move above their Pacific rivals in the World Series standings. Metuisela Talebula scored twice in the final after they had earlier beaten England 34-19 in the semi-final. Lavin Asego broke Scottish hearts as he scored the decisive try for Kenya after the buzzer had sounded in an enthralling Bowl final. Benjamin Ayimba's side had taken a 14-0 lead, but Michael Fedo and Lee Jones drew the scores level. As the match entered its final play, it was Asego who silenced the Murrayfield crowd and avenged a defeat to Scotland in the Bowl final at Twickenham last weekend and picked up four Series points. Canada took out the Shield title thanks to tries from Mitchell Gudgeon and Sean Duke (two) to end their season with some silverware.